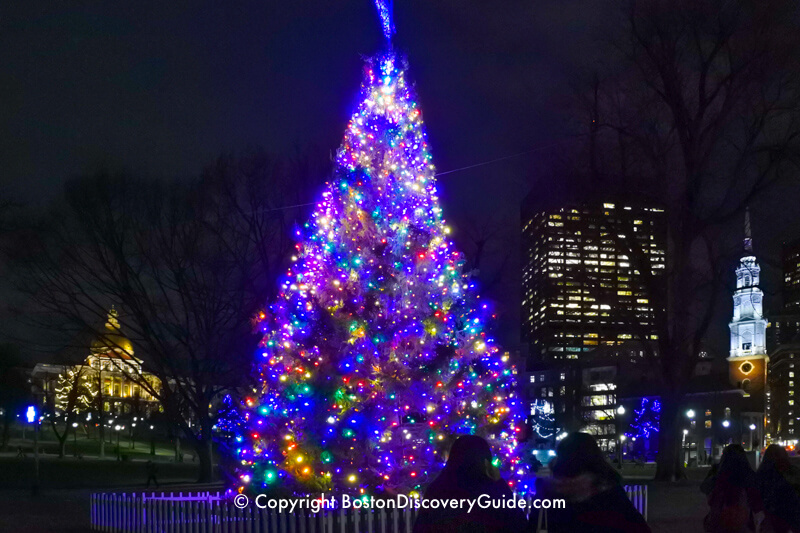 Christmas in Boston turns the city into a festive wonderland of lights, spectacular decorations, special holiday music and shows, and plenty of good cheer. The winter holiday season is a wonderful time to visit! Stop by Boston Common for a round of ice skating or walk over to Faneuil Hall Marketplace to see the free Blink! light and music show. Attend The Nutcracker or Black Nativity . . . enjoy a Holiday Pops concert at Symphony Hall . 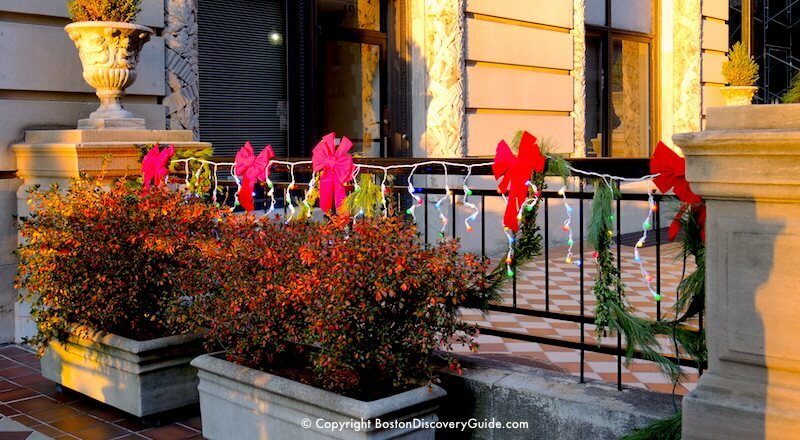 . . take part in special Boston Christmas Eve cruises . . . or attend Christmas Eve midnight mass or church services . . . or just walk around and enjoy all the dazzling lighted trees, serenading carolers, and maybe even snow. 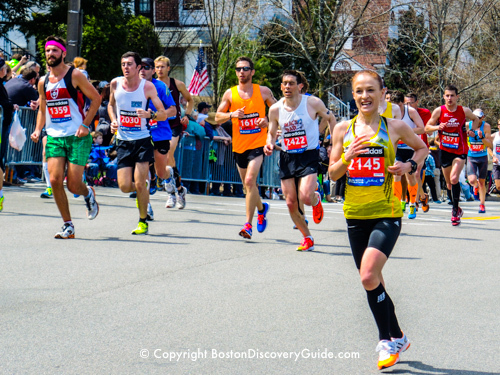 Need more suggestions about what to do in Boston in December? Check the December Events Calendar. 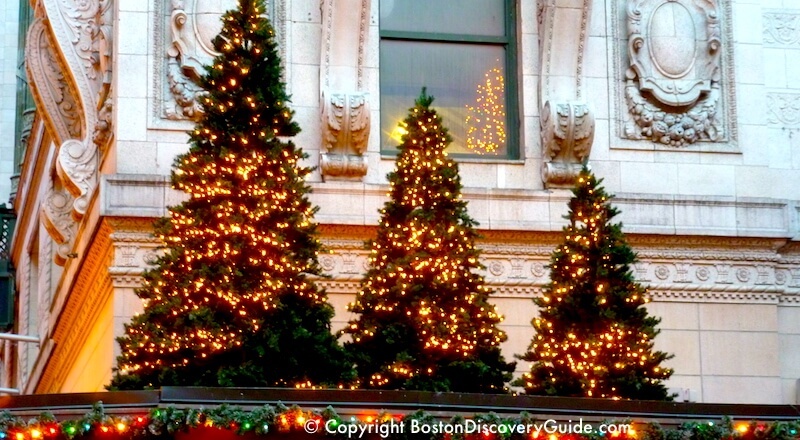 By late November and early December, Boston sparkles with beautifully decorated and festively lit Christmas trees. Two of the biggest trees stand proudly in Boston Common and Faneuil Hall Marketplace, site of the Blink! holiday lights and music show. You can find more lighted trees near Macy's in pedestrian-friendly Downtown Crossing - plus plenty more in store windows, hotel lobbies, and restaurants. As usual, The Nutcracker and Disney on Ice top the list of favorites, and are joined this year several other special holiday shows. Discount and half price tickets start to become available for some performances about 4-8 weeks before the event. They go fast - so if you see tickets you want, grab them! Blink! combines 350,000 flashing LED lights and holiday music to set Faneuil Hall Marketplace ablaze every evening through early January. Catch the free show, which runs numerous times between 4:30pm and 10pm from late November through early January as you stroll around the country's open-air marketplace, site of the largest Christmas tree in New England. The show, which changes year-to-year, is especially fabulous this year. Faneuil Marketplace also offers excellent shopping opportunities - lots of unique "only in Boston" boutiques mixed in with larger national chains where you'll often see "40% off" signs. If you're looking specifically for events on Christmas Eve, you'll find an excellent mix of music, entertainment, and religious services. Keep in mind that many businesses close early, some restaurants will be open only for lunch while others may close all day, and stores will be packed full of last minute shoppers. Some attractions and tours may also be closed for part or all of Christmas Eve. 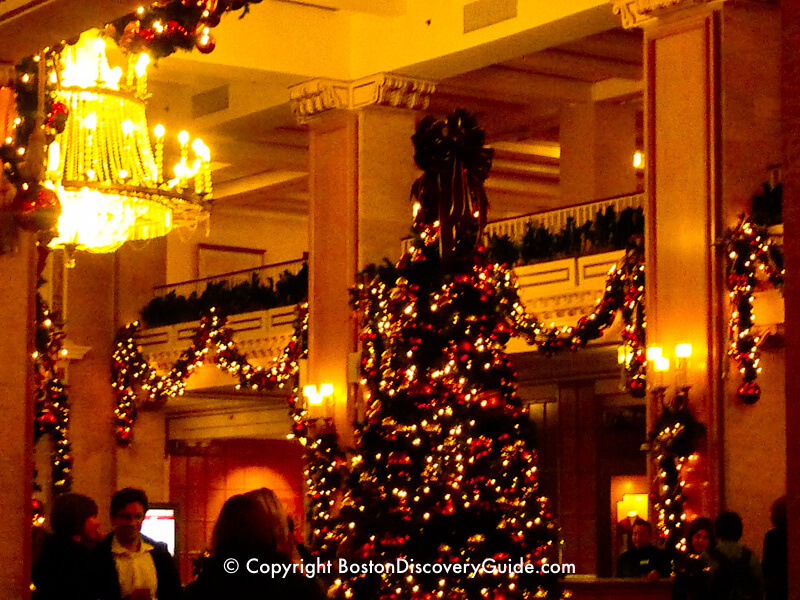 Boston hotels deck their halls - and their lobbies - with lavish seasonal splendor throughout December and the holiday season. Better yet, they get into the spirit of giving by offering special holiday packages. 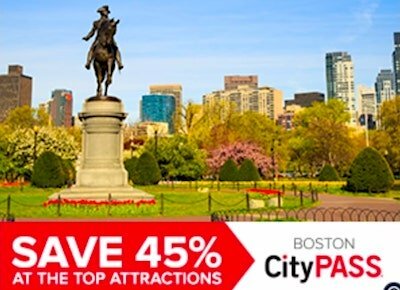 Don't forget that Boston discount passes can save you up to 50% and more on top attractions during the holidays. They also make nice holiday gifts. 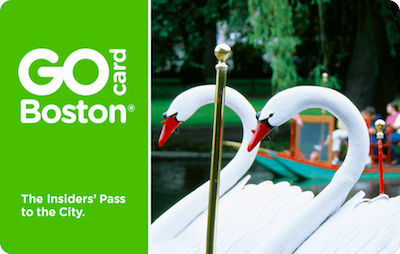 Using a discount card is the easiest way to save money in Boston! Boston stores deck their halls - and walls, windows, aisles - with holiday decorations designed to put you into the spending, and of course giving, spirit. Just seeing all the decorations can be lots of fun. 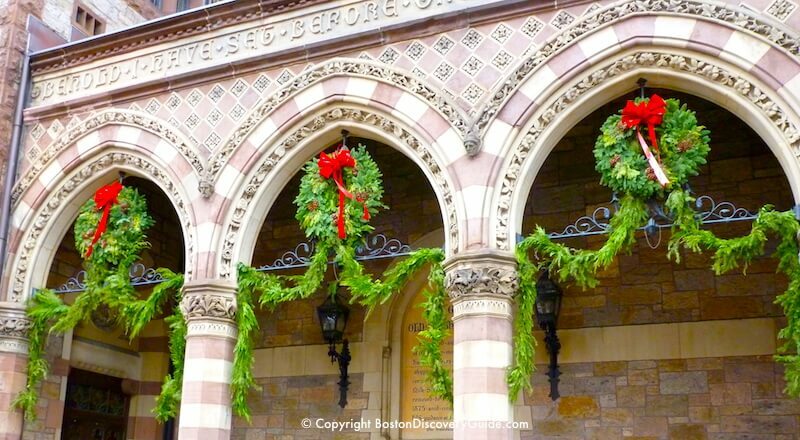 But if you're serious about shopping, read our recommendations for the best places for Christmas shopping in Boston, especially if you want to accomplish a lot in a short time. 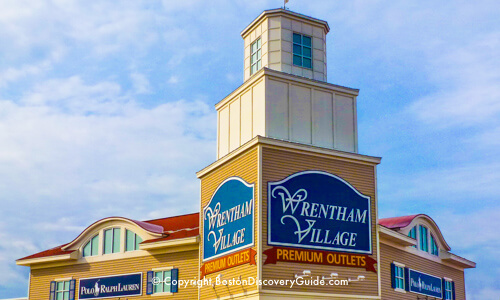 For biggest savings at discount outlets, check out Wrentham Village and Assembly Row. 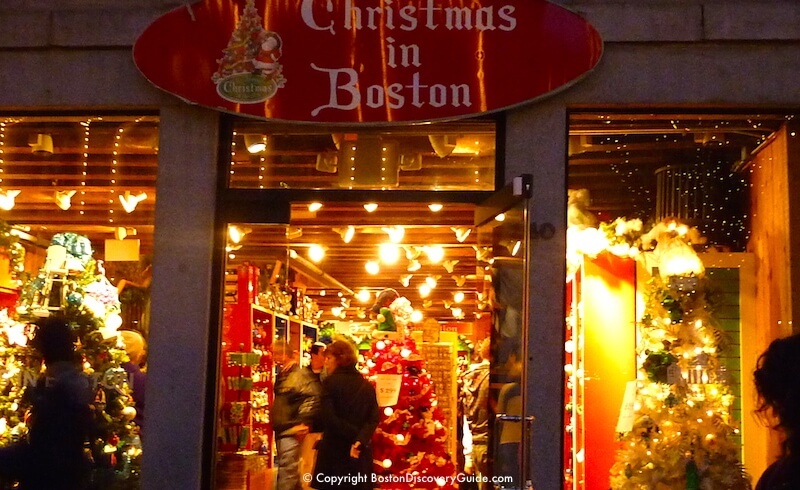 Look for Boston's festive pop-up Downtown Holiday Arts Market in Downtown Crossing on Washington Street across from Macy's - a 2-minute walk down Winter Street from Boston Common. A Santa or two as well as frequent musical performances make it easy to spot. Look for special creations such as one-of-a-kind jewelry, handcrafted gifts and decorative items, and delicious homemade and organic gourmet treats - plus plenty of Christmas trees on display. Downtown Holiday Arts Market launches this year on November 23rd and remains open until January 6th. It's open 7 days/week from 11am to 7pm Monday through Saturday, and 11am - 5pm on Sundays. One of the serendipitous delights about walking around Boston in December is happening upon a group of Christmas carolers. 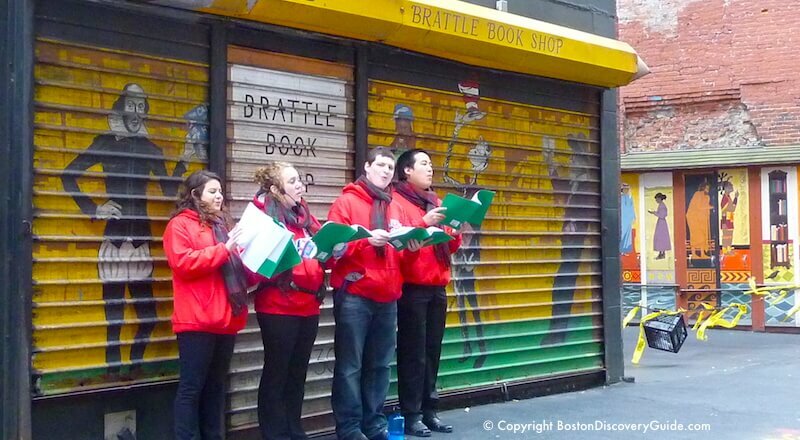 Some perform in predictable places like Faneuil Hall Marketplace and in Downtown Crossing near Macy's, but others appear in random places, singing just for the sheer joy of sharing traditional holiday music and Christmas carols. 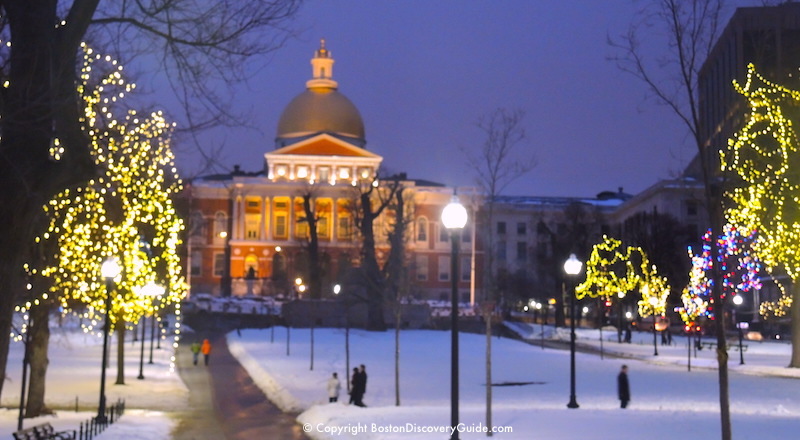 Walk around Beacon Hill on almost any evening as Christmas draws near, and you're likely to hear a caroling party or two singing as they wind their way around the narrow streets, carrying candles and spreading holiday cheer. Want to participate? Gather a few of your friends, neighbors, and family members, light a few candles, and form your own caroling party. 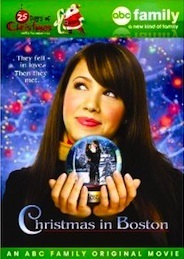 The holiday season brings the perfect excuse to watch Christmas in Boston, a light-hearted chick-flick movie. The plot is silly but sweet - pen pals since middle school, Gina and Seth have never met ...until finally Seth needs to make a Christmas week trip to Boston where Gina works. The problem? All these years, they've been exchanging photos ... but of their best friends rather than of themselves. You can probably guess what happens - but still, it's fun to watch. Note - don't watch this movie with your young kids unless you want to explain a non-culinary use of chocolate syrup. Boston has plenty of Santas to grant Christmas gift wishes - or at least listen to your child's fantasy gift list. 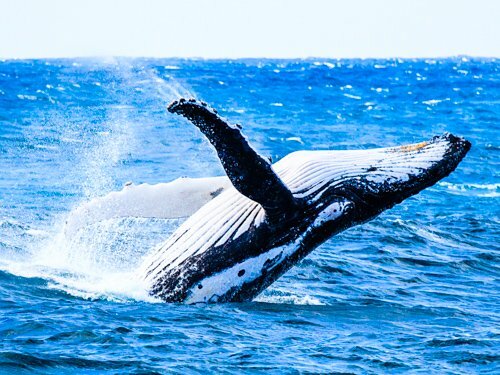 You'll get some great photos - a perhaps a few surprises as you hear the wish list unfold. 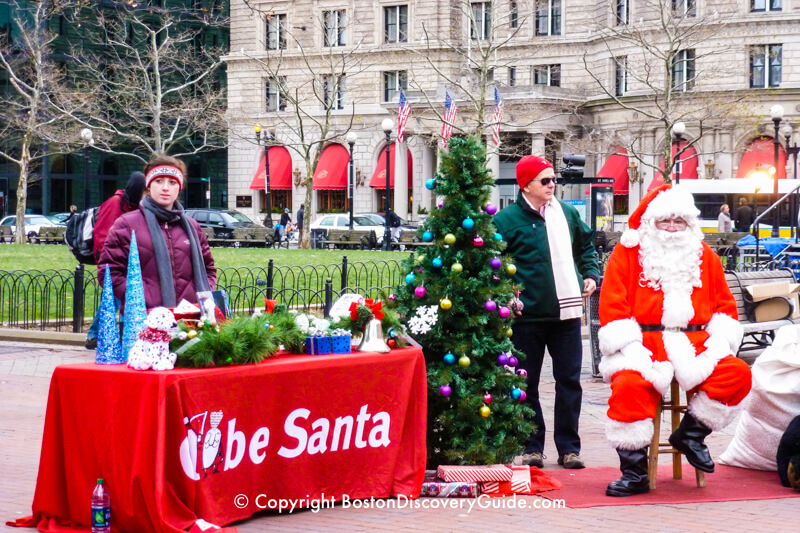 But to get into the real spirit of Christmas in Boston, watch for Globe Santa, who appears at various places throughout the city during the holiday season (hint: one place to find Globe Santa is in the Rotunda at Faneuil Hall Marketplace every Wednesday through Sunday during the holiday season). This is a special Santa, one who really does make wishes come true for the city's neediest families. When you see him (or her) - give generously! 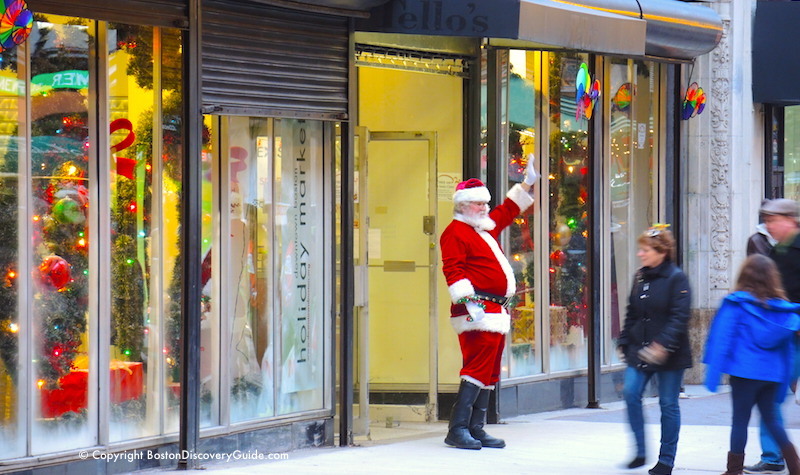 You can find plenty more Santas throughout the city - try the Shops at Prudential Center, Assembly Row, Downtown Crossing - look for pop-up Christmas markets, and practically every Boston shopping mall. 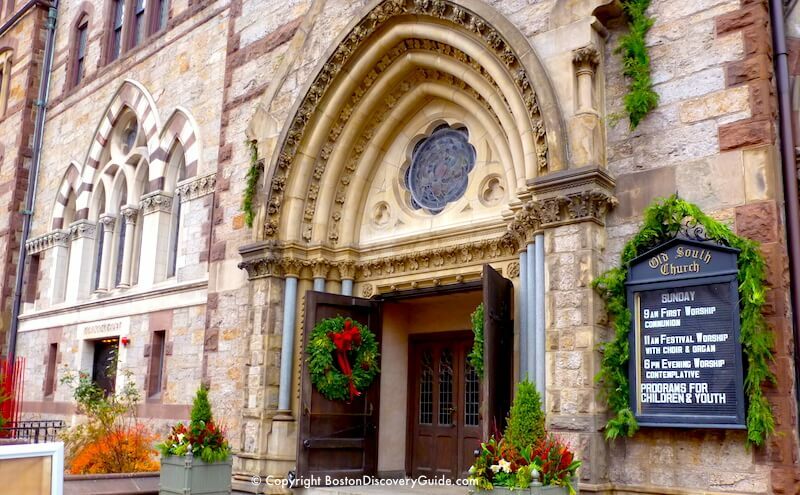 If you're visiting Boston and want to attend Christmas Eve services, Midnight Mass, Christmas Day church services, or Hanukkah or Shabbat services, you'll find a warm welcome from our famous churches and synagogues, regardless of your personal beliefs or religion. - Trinity Church (Episcopal; 206 Clarendon St, Copley Square; 617-536-0944; www.trinitychurchboston.org) - World-famous architectural masterpiece by H.H. Richardson; afternoon and midnight services, with special organ music. - Vilna Shul (Jewish cultural center and historic synagogue; 18 Phillips Street, Beacon Hill neighborhood, Boston; 617-523-2324; www.vilnashul.org) - Built in 1919 but home to a traditional Jewish synagogue of Lithuanian immigrants formed in the 1890s. Beautiful murals are currently undergoing restoration. Hosts Hanukkah events and special Shabbats. (Closed for renovations f until Summer, 2019). Menorah lights glow on the 32-foot tall menorah in Copley Square during each night of Hanukkah (begins December 22, 2019). Sponsored by Chabad of Boston. 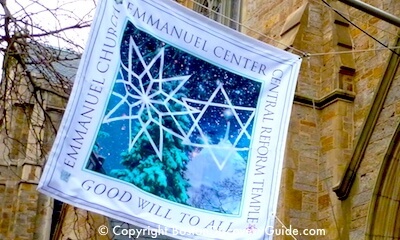 You'll see more menorahs at the Massachusetts State House, Faneuil Marketplace, Boston Common, and other locations. Old North Church Annual Christmas Concert - Sunday, December 8th, 5pm, (to be confirmed for 2019) 193 Salem Street in the North End. Arrangements of familiar Christmas carols and Christmas-inspired works for choir and orchestra. $10 offering suggested at the door; advance tickets not required. More information: 617-523-6676. 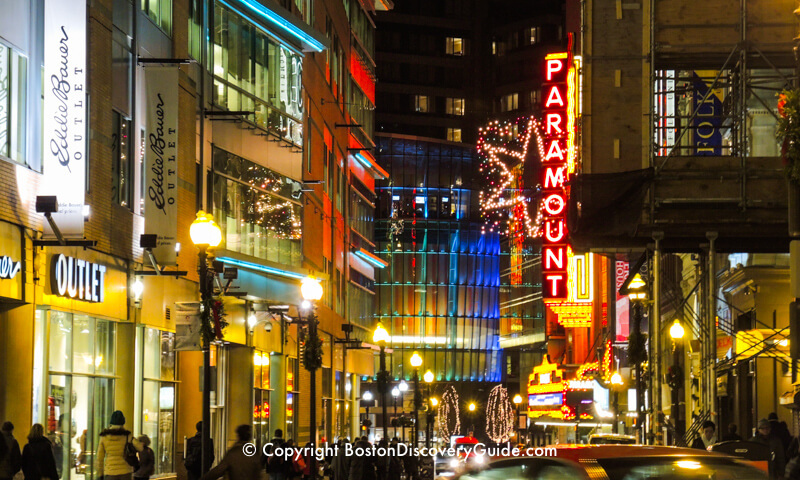 Loews Boston Common Theater - 19 screens of entertainment (175 Tremont Street, across from Boston Common); call 888-262-4386 for shows and times. Chinatown restaurants - Many, although not all, are open on Christmas Eve and Christmas Day. Numerous Christmas-themed Boston fund-raising events during December provide funds for those who might not otherwise have happy holidays. You'll see lots of Santas, such as this group heading into Game On! near Fenway Park, engaged in these fund raising activities. Perhaps the most famous is the Santa Speedo Run, involving about 500 scantily clad Santas running a loop down Boylston Street and up Newbury Street. They warm the hearts of shoppers - and raise a significant amount of money for local charities. 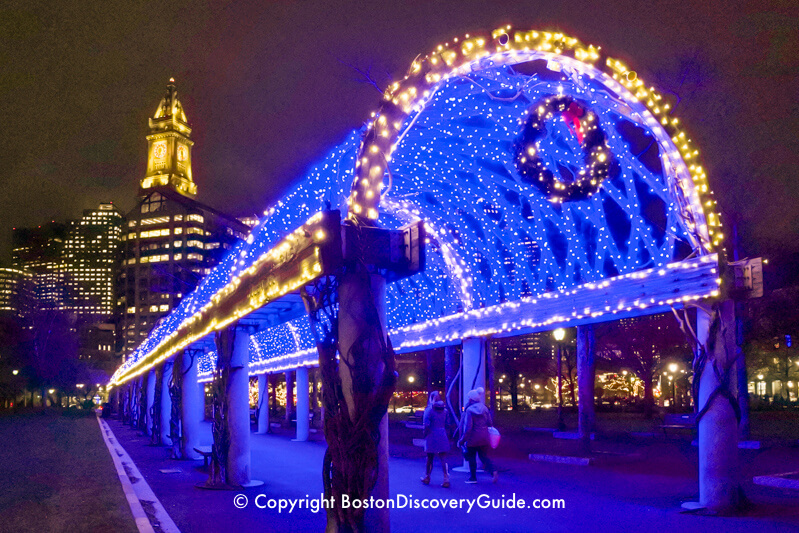 Boston Attractions on Christmas - Open or Closed? Most theaters, stores, the Frog Pond ice skating rink, and museums will be closed on Christmas. 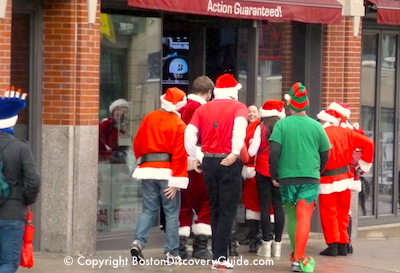 So what can you do on Christmas Day in Boston? Most Boston movie theaters will be open (be sure to check first), including AMC Loews Boston Common 19 (175Tremont Street, across from the Common). Blink! 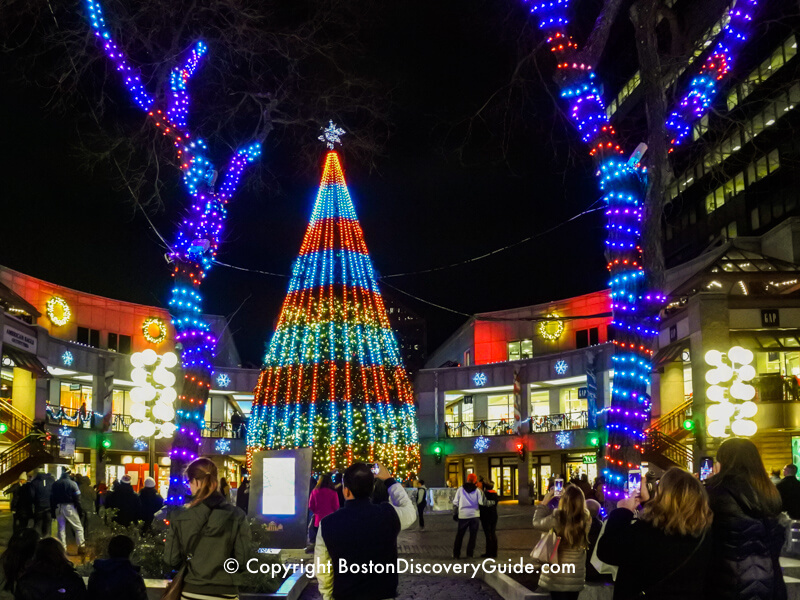 at Faneuil Hall Marketplace - Stores will be closed for business but come watch the breathtaking light and music show - a beautiful finish to Christmas Day. Many Boston restaurants, including most hotel restaurants plus a number of others, will be serving Christmas dinner. 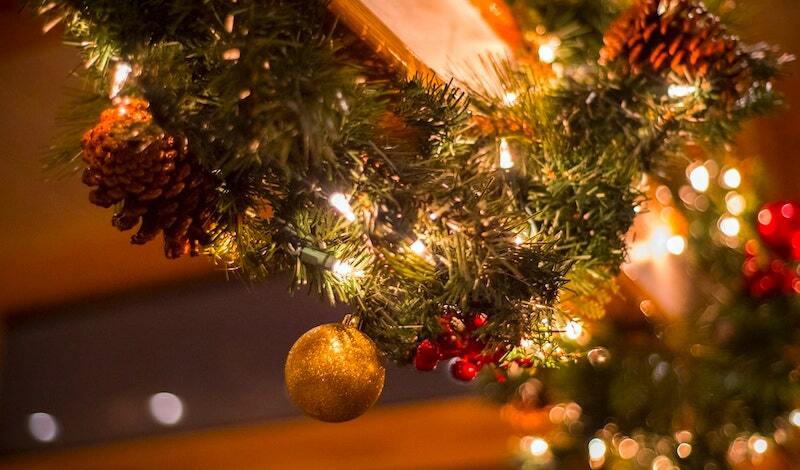 Reservations are a MUST on Christmas Eve and Christmas Day, because this is a popular time to go out. If you don't plan ahead and can't get reservations, keep in mind that many Chinatown restaurants will be open, as well as most hotel bars where you'll usually find excellent bar menus. Sometimes Christmas in Boston feels like it ends too soon - but no worries, Boston's gala First Night extravaganza is just around the corner. 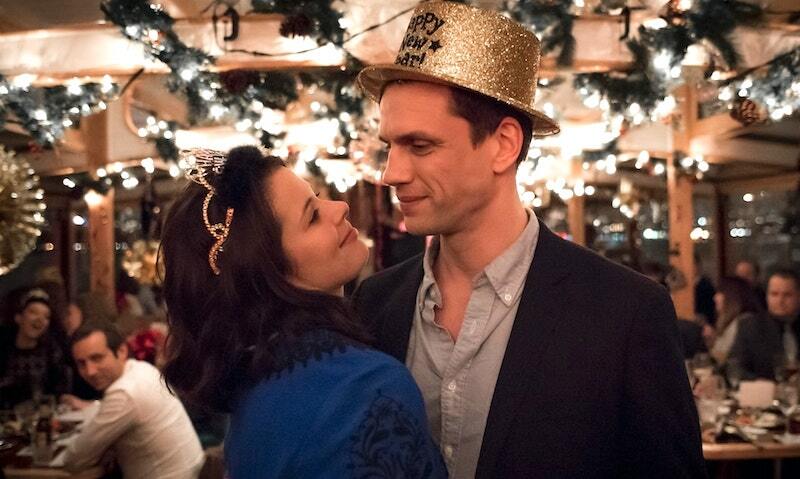 So even if Christmas is still in the future, it's not too early to plan for NYE. Most important, if you're coming into the city for the big event, make your hotel reservations NOW to avoid disappointment - check out all the Boston New Year's Eve hotel specials. 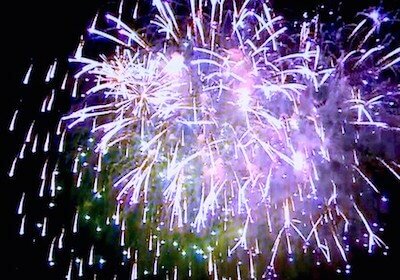 Best Boston New Year's Eve Parties!